Aromatherapy massage is the time honoured practice of combining a carrier oil blended with individually chosen essential oils with relaxing and stroking massage movements to promote healing and restore body, mind and spirit to a state of balance and well-being. The oils are absorbed into the bloodstream where each of their unique combination of constituents interact with the body’s chemistry and in turn affect certain organs or body systems as a whole. 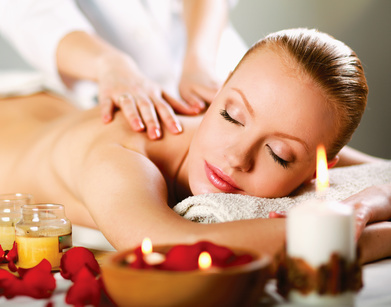 Swedish body massage has been described as “the manipulation of the soft tissue for therapeutic purposes”. Swedish massage is an aid to circulation, which can help to improve the flexibility of joints, increasing their range of motion. Muscle tone is often improved as a result, with waste products present in the muscles being eliminated. Increased circulation also delivers an increased oxygen supply to the cells of the body; this can speed up metabolism and lead to healthier cell function. Indian Head Massage or ‘Champissage’ is the the name given for head, neck and shoulder massage that has been practised for generations in India to promote hair growth and good health. It is becoming increasingly popular as a natural and effective means of relieving stress and promoting health and well-being. The massage is carried out seated in a chair and includes massage of the upper back, neck, shoulders, upper arms, scalp, hair and face. Oils may or may not be used during the treatment. In the feet are reflex areas corresponding to all parts of the body and these areas are arranged in such a way as to form a map of the body in the feet. Thus, it becomes possible to treat the body as a whole, allowing not only symptoms to be treated but also their causes. A reflexologist uses a very specific method using thumb and fingers to apply gentle, controlled pressure to the reflexes of the feet. By so doing, muscle tensions are relaxed, allowing the body to fall into a deep state of relaxation, clearing blocked energy channels. Toxins are released and circulation is stimulated. As energy is able to flow more freely around the body, the functioning of the body’s systems is optimised, encouraging the body to heal itself. ▪ (MLD) is an advanced massage technique that can be practised anywhere on the body. This gentle precise technique aims to assist the body’s lymphatic system, moving lymph towards the lymph nodes, where the body can dispose of sluggish, blocked or stagnant areas more easily. ▪ MLD is painless, deeply relaxing, comforting and healing. ▪ MLD stimulates the lymphatic system so it works more efficient. Allowing new fluid to circulate freely bringing abundant water, nutrients and oxygen to cells, thus increasing vitality and health. • Immune system stimulation and prevention of post-surgical infections. • Improvement of skin regeneration and wound healing to optimise the scarring process. • Eases patient recovery from surgery and enhance overall health and well-being.